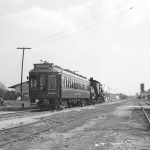 This photo was taken sometime in August to October, 1946 while on an inspection trip ordered by Pacific Electric management to view the trackage of Southern Pacific’s Covina Branch which PE was about to purchase. With all the dignitaries aboard, a road foreman or trainmaster is about to swing up the ladder and into the cab. Note he has the staff in his left hand authorizing occupancy of the main track between Irwindale and Covina. Upon arrival at the east switch of the siding the train will stop while this staff is replaced in the machine adjacent to the switch and another one authorizing movement to Lone Hill is obtained. 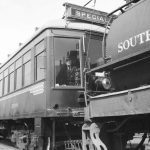 The SP had installed their staff system many years prior on the Covina Branch and by 1946 it extended between Baldwin Park and Ganesha Jct. The inherent delays to stop and obtain staff authority caused much irritation to passengers as well as freight crews. Adding to the delay, PE installed their own staff system to protect movements on their single track line east of Monte Vista, (.58 miles east of the Covina station), to the connection with the SP at Lone Hill. The purchase of SP’s track between Bassett and Ganesha Jct. 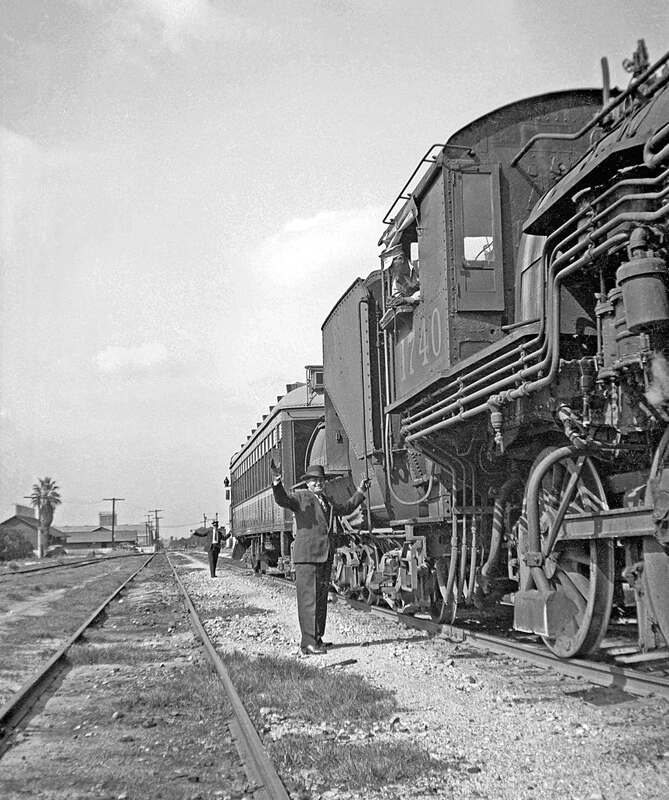 meant the ultimate abandonment of PE’s trackage between Baldwin Park and Lone Hill and to the citizens of Covina brought long sought relief from the presence of freight trains on Badillo St. through downtown Covina along with all traces of both SP and PE’s antiquated staff machine operations. Another dumb question…Given Espee practices about straw hats in summer, would you be able to narrow the date range, or is he too low in rank to be affected by this?